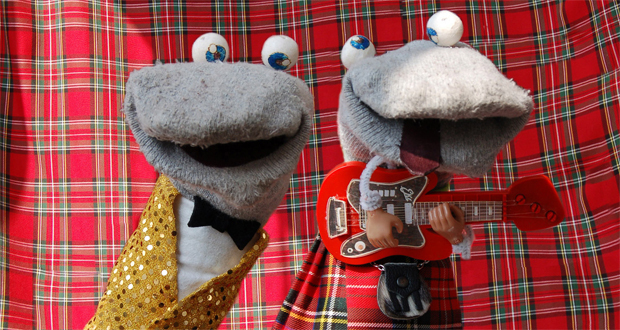 Discounting appearances in The Sitcom Trials, The Scottish Falsetto Sock Puppet Theatre mark their fifth year at the Fringe with two different shows: a morning family show, and this, a late-night show for the grown ups. Doubling up like this seems to be the way forward for performers with the faintest ambition of losing less than thousands at the Fringe. The Sock Master, Kev F. Sutherland, skipped Edinburgh last year to save up for this year’s festival. The set-up is simple. One bloke behind a Punch & Judy-style barrier that looks like it could attack the front row at any moment if the puppeteer breathed too hard. Hands inside socks. Puns. We’re off. The late-night show uses horror films as a dartboard at which to throw pun after pun, and those that do bounce back are just as satisfying. The show has more groans than Babestation. The opening logo of “20th Century Sox”, reproduced on cardboard, establishes the tone for the evening. That so many laughs and groans can be repeatedly accrued from so many puns about socks is a credit to Sutherland’s performance. It’s not just about the puns. There are some musical numbers, with cheeky little attachments to the puppets. Sorry, ‘performers’. These sequences are fun, but serve for Sutherland to get his breath back after the sustained machine-gun rate of delivery. The Socks are at their best when firing line after line at each other. The vocal, mental and, judging by the sweat on Sutherland’s face at the end, physical dexterity is pretty impressive. Ad libs are aplenty, and audience put-downs aren’t as face-threatening when they come from a pair of socks. “The Socky Horror Show” is probably the joke that best demonstrates the kind of material we’re dealing with. I’m only retelling that gag here because it’s likely that will replace “Boo Lingerie” as the title for the touring version of this show. Hopefully the Socks will venture to the North East on this tour (they got as far as Salford in 2010), as they would feel comfy on a few stages I could think of. Date of live review: Sunday 26th August 2012.